I've recently read a few books (or in one case, didn't finish) that I didn't take particularly good notes about, which means I can't write a full-on review. But, I wanted to give some quickie thoughts on these three, which I recommend with varying degrees of enthusiasm. Like the other two books in this series, The Last Echo features a creepy mystery. However, (vagueness intentional so as to not spoil the series) in this instance Violet's life has changed tremendously and the context of her involvement with the crime solving is more intense and the stakes are a whole lot higher. If it wasn't for the lack of Jay page time, I'd say this is the best in the series (the mystery and overarching story is quite good). However, because Jay is such a fantastic YA love interest, I've got to say the second, Desires of the Dead, is still my favorite. The Last Echo really set the stage for an intense climax, so I'm looking forward to cracking open Dead Silence soon. It's funny, I've given each of these novels three stars on Goodreads, which is often a "meh" rating for me, but I do really like this series. The reason I've rated them thusly is more a product of the genre (of which I'm more critical than I am of contemporary/realistic fiction), as opposed to the books themselves--you really can't go wrong if you're looking for a quality paranormal YA series (or if you know a teen you want to steer toward girl-positive paranormal novels). One of the fabulous ladies from my book club, Linsey, insisted that I read Hold Me Closer, Necromancer (our book club meetings feature a big book exchange in which we push books on each other--I'm sure this whole scene is amusing to the folks at Pacific Pie Company) and I'm so glad she did. This quirky urban fantasy had me reading passages aloud to my husband. 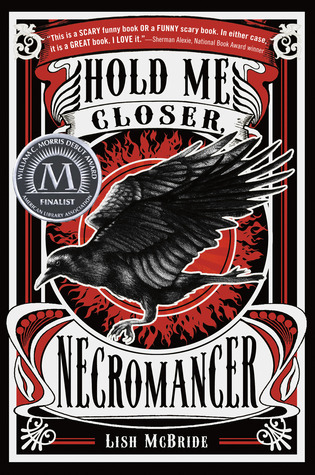 In case you're one of the four people who hasn't read this book, it's about Sam, a college dropout and not-so dedicated fast food employee who discovers that he's a necromancer--he can raise the dead. He and his rag-tag pals from the fast food joint quickly find themselves embroiled in a big mess as evil necromancer Douglas sets out to use Sam's considerable powers for his own benefit. I'm usually not a fan of urban fantasy that has loads of different paranormal creatures because the world-building usually suffers (looking at you, Sookie Stackhouse). However, Hold Me Closer, Necromancer has nearly every type of paranormal type and then some, but it just makes the book more fun--and all the more overwhelming for Sam, who's definitely in over his head. I'd be remiss in not mentioning the love interest in this book, Brid. She's a badass alpha of the local werewolf pack and the chapters from her (third-person) point-of-view were probably my favorites. I'm definitely on board for the rest of this series. FYI: The hardcover is bargain priced at under $7 on Amazon at the moment. Every single book that author Trish Doller has recommended to me has been a five-star, top-notch, damn-near-perfect read for me and Saltwater Moons is no different. This novel follows Sun during her last year of school in a rural/coastal community in Australia. She navigates her first relationship; an aching, lingering something with another boy; and the changing connections she has with her childhood friends and parents. "No, no, no, no, NOOOOOOOOO!" That's because so many moments were so incredibly awkwardly teenage. Sun rarely trusts herself, assuming that her gut instinct is wrong--even though it's usually right. Her inner turmoil between what she wants and what she believes she should do are absolutely spot-on for an 18 year old girl. I actually feel like a bit of a jerk recommending this book so highly because because it's out-of-print and seems to be unavailable at all the usual places. But, if you happen to come across it, snag Saltwater Moons and don't look back. Mar 22 Links + Things: Justin Timberlake! The Calming Manatee! Plagiarism (Ugh)! Sexism (Double Ugh)! Libraries! General Interestingness!